While FAA regulations have stalled commercial UAV business in the U.S., it's growing in the Middle Kingdom. In building drones that kill people, the U.S. has a couple-decade head start on China. But when it comes to domestic uses, U.S. businesses are hamstrung because the Federal Aviation Administration (FAA) isn't required to issue commercial drone rules until 2015. In the meantime, one of China's biggest delivery companies is tinkering with using drones--with Chinese government permission. 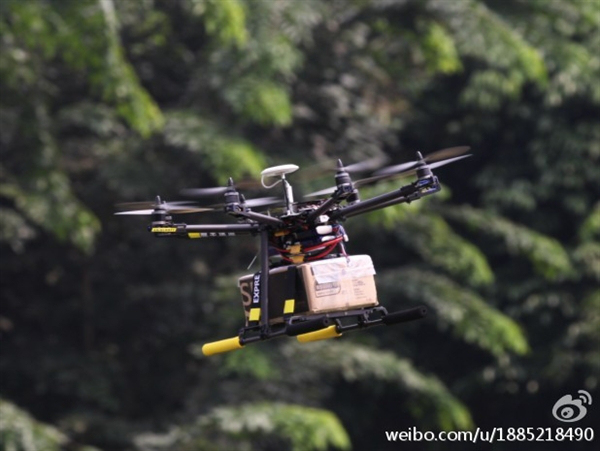 SF Express is testing a drone it has built for delivering packages to remote areas, according to Chinese media reports. The drone can hit an maximum altitude of 328 feet and deliver parcels within two meters of its target. It's not clear what sort of weight these puppies can handle, but Beijing journalists calculated that it probably can't carry more than 6.6 pounds. The news broke yesterday morning, after a Sina Weibo user noticed what looked like a UFO hovering above a street in Dongguang, in southern China, and after noticing a SF Express logo, posted images online. 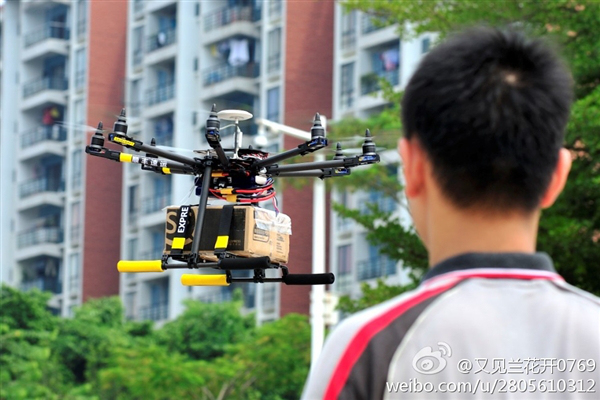 In July, a Shanghai bakery launched aerial cake delivery--or "pie in the sky," as the Telegraph put it (video below). However, as an anonymous government official told the Shanghai Daily at the time, businesses that want to use drones must be granted approval from the local civil aviation authorities first. The bakers forgot to do that, apparently. However, the Dongguan police said that, except during certain sensitive times, commercial operators who receive permission from the civil aviation regulator and air traffic control are allowed to fly drones. SF Express says it's strictly complying with the policies. Drone delivery undoubtedly has a certain appeal to the Chinese authorities, who are increasingly struggling to control both traffic and pollution in China's major cities. On top of that, e-commerce is growing much faster than delivery infrastructure in rural and mountainous parts of China, such that logistics systems are emerging as a big area of investment. In fact, a consortium including CITIC Capital took a 25 percent stake in SF Express in late August. In the U.S., meanwhile, the jury on commercial drones is still out (even as the postal service sometimes reaches remote areas of the U.S. via mules and sled dogs). The FAA estimates that there will be 30,000 drones in U.S. airspace by 2020. But the prospects will be unclear until it issues its new rules in 2015. And while it okayed two drones for commercial use in early August, both were costly, state-of-the-art drones owned by prominent companies--Boeing and AeroVironment Inc--making it hard to guess the FAA's views on cheaper drones. In the meantime, a slew of U.S. state laws designed to protect citizens from surveillance by law-enforcement drones threaten to limit the use of commercial drones too, at least the FAA rules come out.